Remember those metallic blue stick on nails I showed last week? 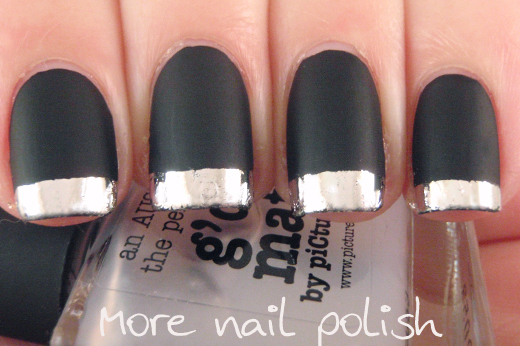 When I was in Price Attack I spotted another pair that was matte black with metallic silver tips. I found the packaging for my metallic blue nails and they are 1000Hour Metallic Nailz. 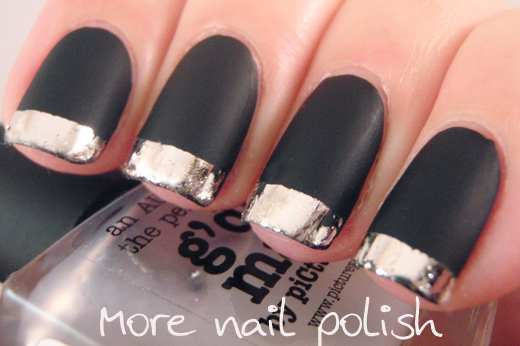 Here are the matte black and silver tip ones I saw. I thought I would try to create a similar look on my own nails. I started with JOSS Little Black Dress, which is the best one coat super black polish I own. 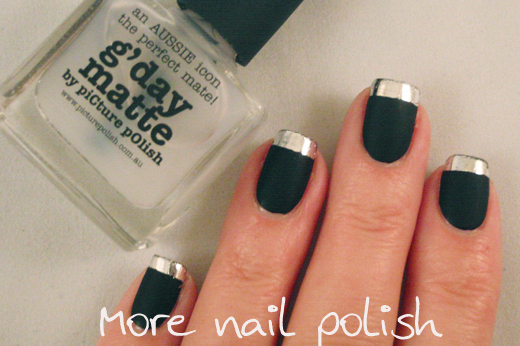 Next I applied G'day Matte - Picture Polish's matte top coat. 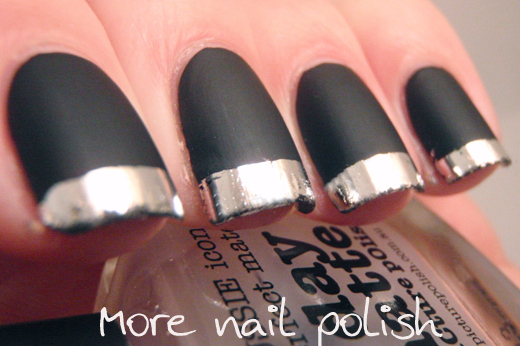 It's a lovely matte top coat that dries to a very smooth matte finish. I also found that wear on G'day Matte was better than other matte top coats I own, it didn't seem to get glossy as fast as other ones. For the silver tips, I applied nail foil glue and let it dry for a good five minute. I then stuck silver nail foil on the glue. I let that dry thoroughly and then carefully applied a thin layer of Picture Polish Revolution just to the silver tip. So these aren't as perfect as the stick on version, but from a distance they look pretty amazing. this is gorgeous!! i haven't put my matte topcoat to good enough use, i will definitely be trying this... though i don't have nail foil - do you think a shiny nail polish like orly rage might work too? Yes, I think Orly Rage would look great! Any foil or chrome would look pretty close.